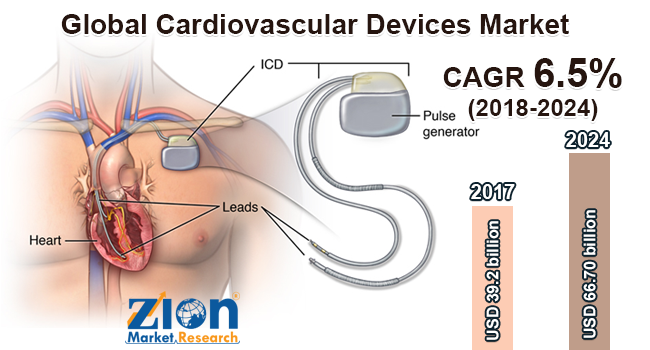 Zion Market Research has published a new report titled “Cardiovascular Devices Market by Device Type (Cardiac Diagnostics & Monitoring Devices, Electrophysiology Devices, Peripheral Vascular Devices, Interventional Cardiac Devices, Cardiac Rhythm Management, Cardiac Prosthetic Devices, and Others): Global Industry Perspective, Comprehensive Analysis, and Forecast, 2018 - 2024”. According to the report, global cardiovascular devices market was valued at approximately USD 39.2 billion in 2017 and is expected to generate revenue of around USD 66.70 billion by 2024, growing at CAGR of around 6.5% between 2018 and 2024. Cardiovascular disease is one of the prominent causes of death among Western countries across the globe. Devices are designed by applying engineering principles for gaining improvement in the functioning of devices, which has minimized several predetermined side effects caused on the health of the patients. Government and ruling authorities are investing prominent share on the studies and research & development of cardiovascular disease for the development of advanced devices in order to replace conventional one. Furthermore, progress has made challenging and complex cardiovascular surgical procedures possible. Cardiovascular devices include indwelling catheters, cardiac valves, hemodialyzers, stents and stent grafts, pacemakers and implantable defibrillators, vascular grafts, blood oxygenators, and circulatory support devices. Increasing intervention of cardiovascular diseases all across the globe has resulted in the upsurge demand for minimally invasive surgeries and this is estimated to drive the global cardiovascular device market. However, the high cost of the devices and stringent regulatory policies by approval committees are acting as restraints for the cardiovascular devices. Nonetheless, ongoing research and development and huge investment in the cardiac segment may be considered as futuristic opportunities for the cardiovascular devices market within the forecast period. On the basis of device type, the cardiovascular devices market is segmented into cardiac diagnostics & monitoring devices, electrophysiology devices, peripheral vascular devices, interventional cardiac devices, cardiac rhythm management (CRM), cardiac prosthetic devices, and others. Cardiac diagnostic and monitoring devices dominated the cardiovascular devices market because of their compact and portable designs followed by cardiac rhythm management. North America, Asia Pacific, Europe, Latin America, and the Middle East & Africa are key regional segments of the global cardiovascular devices market. North America is estimated to lead the global cardiovascular device market over the near future followed by Europe. Moreover, the U.S. is expected to acquire the highest market value share in the North America cardiovascular devices market. This is primarily due to the presence of high obesity percentage and disposable income in this region. The Asia Pacific is expected to show prominent growth in the cardiovascular devices market over the forecast period. Moreover, the Middle East and Africa and Latin America are also estimated to grow at a moderate pace in the global market in the near future. The report also includes detailed profiles of end players such as Aboimed, Inc., Abbott Vascular, Biotronik SE & Co. KG, B. Braun Melsungen AG, Cardinal Health Inc., Boston Scientific Corporation, Cook Medical, Inc., Cordis Corporation, GE Healthcare, JOHNSON & JOHNSON, and others.